The best part of my trip to Thailand this year involved being covered in mud and the excrement of a herd of pachyderms. This wasn’t some sort of adrenaline junkie excursion, nor was it the exploration of the latest in homeopathic skin care; I am only moderately adventurous and would not willingly rub poo on my face even with the promise of looking ten years younger (fifteen years, maybe…). The excrement was produced by a herd of elephants at the Elephant Jungle Sanctuary in Chiang Mai, and the mud I used to help protect these glorious creatures from the unforgiving Thai heat. When my family decided to holiday in Thailand, interacting with elephants was at the top of my “must-do” list. I don’t need to explain why; I think a fascination with these animals — who are at once fierce and serene, majestic and humble — is almost universal. I knew that Thailand, like many parts of Asia, offered elephant experiences that were far more intimate than the zoo, but I also knew from the spotlight on elephant cruelty over the last couple of years, that many of these experiences featured captive elephants that had been taken from their mothers and beaten into submission. Furthermore, captive elephants are kept in substandard, unhealthy living conditions and are often forced to allow tourists to ride on their backs — a practice that causes permanent vertebral damage. I was interested in the programs that rescue elephants from tourist programs that exploit the animals. One of the most notable and well respected in Thailand seems to be Boon Lott’s Elephant Sanctuary. BLES, founded by Katherine Connor, is like a work-centred B&B where patrons live amongst the elephants and care for them during their stay. The reviews for BLES are overwhelmingly positive and, as a result, the waiting list is very long. We couldn’t get a reservation two months in advance; in fact, in April the waiting list was over six months long. We had a similar problem with another highly rated organization — Elephant Nature Park. Elephant Nature Park rescues a variety of animals, but specializes in elephant rescue and rehabilitation. 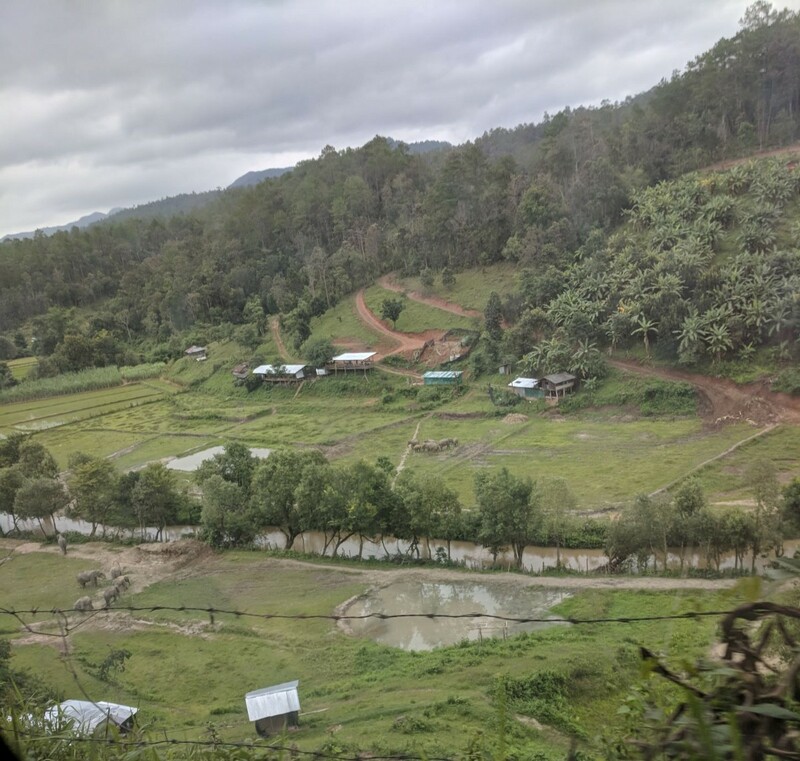 This park offers a variety of elephant-centered experiences that include everything from feeding, bathing, and hiking with elephants to overnight stays in the jungle with a local Karen tribe family (the native people who own many of the elephants). Again, we seemed to be too late in our search for reservations and were unable to book anything that included water-play with the elephants — something I really had my heart set on. A truck from EJS picked my family up at our hotel in the morning for a one-and-a-half-hour scenic trek up into the jungle. We shared the trip with a group of four others: twenty-something backpackers from Ireland, Australia and the U.S. Come to find out, this particular tourist attraction is very popular amongst backpackers; our group of about twenty-five was about 75% twenty-something travellers. My own ragtag group was quite the anomaly. In our late thirties/early forties, my husband, ex-husband and I were at least fifteen years older than everyone except my mother, who is in her sixties. My son, at fourteen, was the baby of the group. When we arrived at the sanctuary and began our descent to our campsite, my mother sensed the age gap. Surrounded by tanned, nubile Europeans who, even though many testified to nursing hangovers, were bounding down craggy hillsides and jumping over streams like gazelles, she feared her ability to keep up during the rest of the trip. She didn’t tell me about this at the time, however; I learned this long after she met each physical challenge with childish glee. Once sufficiently tutored, we were given colorful woven tunics that we were told were modeled after the clothing the Karen hill tribes people wear. Wearing these shirts would supposedly endear the elephants to us. I’m not sure if this was true or just an attempt to make the experience more authentic; later in the tour we did not wear them and the elephants responded to us just fine. Regardless of the practical nature, the tunics look really cool in the pictures. Our first interaction with the elephants was incredible. The tribe we spent the day with included four adult females and two babies. We spent about an hour feeding them sugar cane which the elephants would take from our hands, their trunks seeking around our upper extremities for the food like playful tentacles, and bananas which we would lob into their open mouths after yelling “Bon bon” which, I presume, was a Thai word having to do with eating. In the beginning, our group behaved with reserved reverence — keeping a healthy distance from the animals, gingerly serving up the sugarcane, hastily backing away whenever the elephants moved so as to not encroach on their space. However, by the end of the hour, there was a giddy excitement in the air. At one point I looked over and found my husband hugging the trunk of one female elephant with a content smile that reminded me of my son’s expression when I would pick him up from preschool. 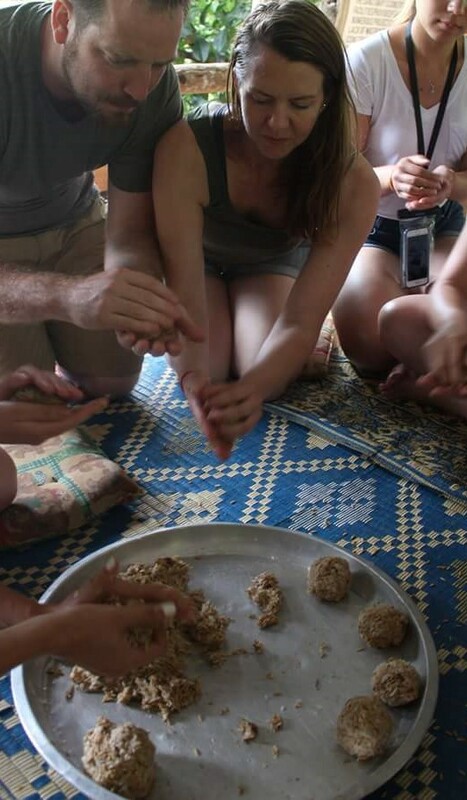 Next, we ate a Thai lunch prepared by our hosts and then were taught how to make elephant “medicine.” The medicine was a mixture of herbs and vegetation which we ground and then formed into large balls. After giving the elephants their medicine we went on a short hike where we were introduced to a couple of male elephants and the sanctuary matriarch, who, my mother noted, was about as old as her. As a means of thermoregulation and to protect their skin, elephants will often roll around in mud or dirt. I’m certain our elephants needed no help doing this, but, perhaps as means of “pampering the elephants or perhaps because the kid in most of us misses playing in the mud, muddying the elephants was left to the participants. This activity was certainly one that required us to tap into our inner child. The mud pit is about the size of two swimming pools and is filled with the slimiest primordial goo — undoubtedly a combination of mud and elephant poo. I have to admit that, as my foot and ankle initially sank into the mud, I was a bit squeamish. I forced myself to reach down for a handful of the sludge and then massaged it on the nearest pachyderm as it lulled and farted, sending gas bubbles rippling across the water. Then the guides picked out a couple of good-natured looking participants (my husband included) to slap with mud and the group became totally uninhibited. People were throwing handfuls of pooey mud on the elephants and on each other (I’m not certain which species came out dirtier). There were, of course, those who refused to come in — the social media princess who kept her frilly bathing suit immaculate as she posed for selfies and those who had forgotten a change of clothes. My own son can be seen in photos lingering just inside the mud pit — a look on his face of disgust and confusion. In the next photo, he’s inspecting the mud, still disgusted, but even more confused. As the photojournal progresses, he slowly bends down, his eyes and lips pursed in resolution, willing himself to thrust his hands in the mud. Then, in the next photo, he’s standing erect and his hands are empty. He’s gazing at the group with a look of absolute confusion — his entire notion of human-civility shattered. Warning: poo play may cause teenagers to fall into existential crisis. After playing in the mud, we walked the elephants to a large pond for cleaner sport. We were given plastic bowls and told splash the elephants with water. This was even more fun than the dirt (but probably no less sanitary). As we splashed the elephants, they filled their trucks with water and easily outperformed us, trumpeting, and rolling around. The baby elephants climbed up on the rolling cows like children wrestling their parents. In the end, bathtime devolved into an all-out water fight between the tourists as the elephants were led away to feed again (it takes a lot to maintain eight thousand pounds). When we said goodbye to the elephants and our new found tribe of elephant loving travellers, we were all a little disappointed to be leaving. Most everyone in our party agreed it was the best part of our Thailand vacation — a truly unforgettable experience. Now, was it truly humane? I think so; the elephants seemed very well taken care of and seemed to have built positive relationships with their handlers. Am I worried it was not humane? Of course. 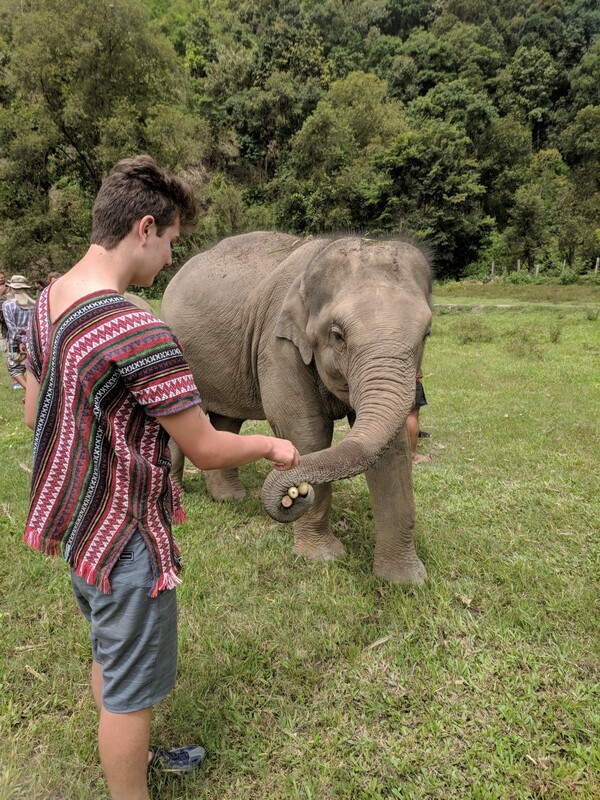 I know that PETA may find fault with the sanctuary: isn’t it exploitative to force the elephants into a feeding and bathing routine for the pleasure of the tourists? And the handlers trained the elephants to give “kisses” (a wet nudge of the trunk against a tourist’s cheek) when part of a sanctuary’s mission is to free elephants from circus-like performances. I’d like to rationalize this — saying the training is as harmless as teaching a dog to sit. There didn’t seem to be any physical threat in the command. But can I be certain? No. What I CAN be certain of is the fact that our entire group left the experience more knowledgeable and with a profound respect for elephants and a passion for their well being. And, as we drove back to Chiang Mai on that bumpy jungle road, I swear my mom looked twenty years younger. Must have been the mud. *If you plan on visiting an elephant sanctuary anywhere in the world, conduct extensive and current research beforehand so that you don’t unwittingly support elephant abuse.